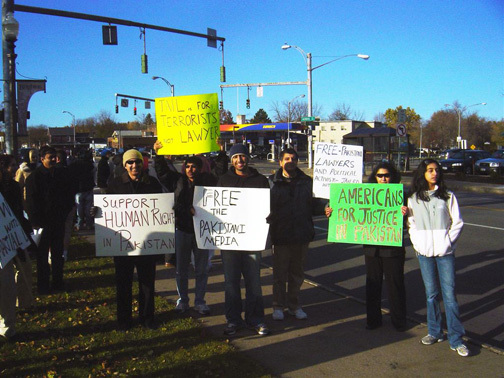 the rally to support justice and democracy in pakistan was a success last sunday, nov 18. about 50 people turned up. it was a diverse group of people from local activists to religious and interfaith groups, from lawyers to teachers and students, from pakistani americans to americans with no ties to pakistan. it was heartening to see that human rights matter to so many. there was plenty of media coverage. here is the article in the democrat and chronicle. “we are here to show our support for the people of pakistan in their struggle for freedom and democracy. civil society in pakistan is being dismantled by the present dictatorship. thousands of lawyers, human rights activists, judges and academics have been put under arrest. hundreds of people who have committed no crime have mysteriously disappeared. shameful instances of torture against prominent lawyers have occurred and the government has even arrested the sisters of opposition leaders. freedom of speech has been curbed and independent media have been shut down. martial law has been declared to supposedly fight terrorists yet the government is actually negotiating with them and every day they grow stronger. and all this after six years and billions of our tax dollars sent to the pakistan army in the name of fighting extremism. obviously, this strategy is not working. thanks to usman for these great pictures! Hey Mara! Thanks for inviting us to come to the event! It went great! Nice pictures!